Developed from years of scientific research, Nephure is a digestive enzyme specially formulated to promote optimal digestion for kidney health. Kidney stone sufferers and other health-conscious individuals can supplement meals with Nephure to transform ordinary food into kidney superfood. The company was founded in 2015, and its products will be sold directly to consumers. Backed by extensive scientific research and the official company founding in 2015, Nephure was ready for action. Almost. The company was definitely ready to set up a website, but not yet release its products. In fact, the goal of the site was to create a lead-generating engine before it started to sell its products. 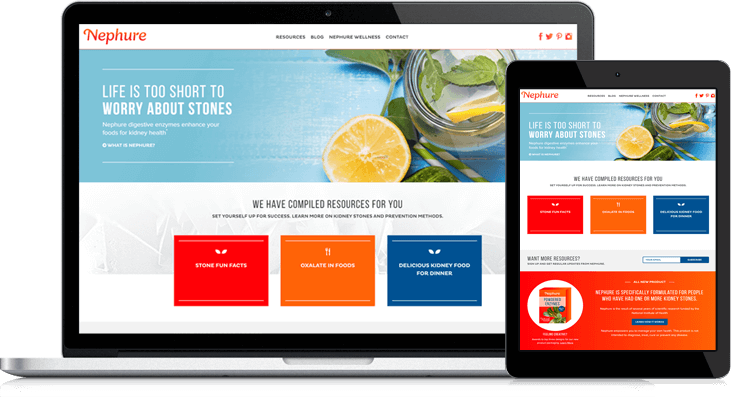 Downloadable content includes recipes, information about oxalates, kidney stone resources, and other white papers in the customized resource center geared toward the company’s four target audiences. Other requirements for the new site included being engaging and friendly for users and optimized for conversions. LyntonWeb covered all bases, with a crisp, clean design, compelling colors and visuals, flip tiles and other custom modules, and straightforward, easy-to-follow navigation. As the B2C face of Nephure brands, the website is primed to soon include a store that can readily sell products geared toward its existing, engaged audience. Even though products are not yet available, the site is hard at work collecting individuals interested in the content offered – who are primed for conversion down the line.